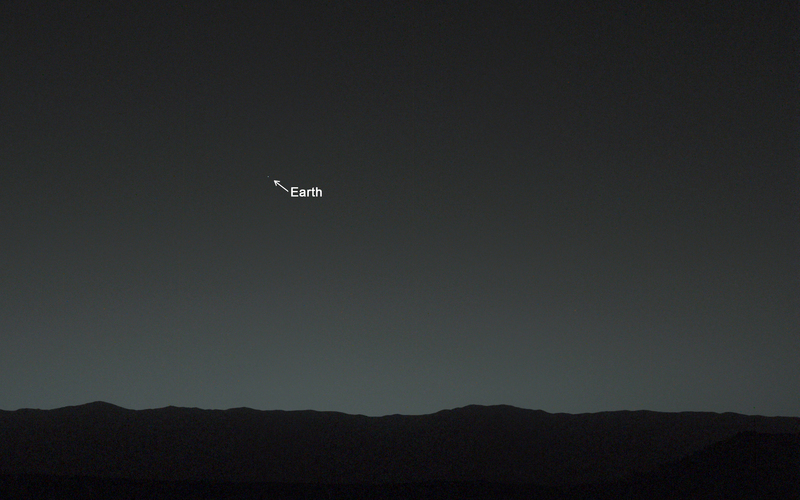 Stunning photo: Earth, as seen from Mars | Watts Up With That? This was just released today by NASA. It is quite a humbling image from the Mars rover Curiosity, though it’s not quite the same impact as the Blue Marble image from Apollo 8, but historically significant nonetheless. This view of the twilight sky and Martian horizon taken by NASA’s Curiosity Mars rover includes Earth as the brightest point of light in the night sky. Earth is a little left of center in the image, and our moon is just below Earth. NASA’s Jet Propulsion Laboratory, a division of the California Institute of Technology, Pasadena, manages the Mars Science Laboratory Project for NASA’s Science Mission Directorate, Washington. JPL designed and built the project’s Curiosity rover. Malin Space Science Systems, San Diego, built and operates the rover’s Mastcam. February 6, 2014 in Astronomy, Space. Earth even looks blue in the image. Has there been any colour correction or is that approximately how the human eye would see it (if it was no Mars)? I am not sure what “processed to remove the effects of cosmic rays” mean. One nice thing: No celebs photobombing it. I guess if you live on Mars, Earth is the Morning Star. Agree with Bob. A humbling reminder of our place in the grand order of things. We really are just a speck in the cosmos. Less than a speck. A new perspective on all our cares and troubles … we are but an evening star with nothing of note to draw anyone’s attention. … and each of us but one being in billions on this speck. I had to clean the dust off my monitor to ensure I was looking at the right speck! Andy also noticed on his NYT Blog. Different emphasis. He could not resist “small is beautiful” in his first sentence. See what real science can do, even when it takes its focus off the real mission to just look around and record observations? Not a model anywhere. Just beautiful data. I’m pretty sure I saw Al Gore’s footprint…..
Did anyone else spot the canals? But seriously though folks, what do Mar’s own moons look like from Mars? Nobody outside the solar system would miss us if it suddenly disappeared. Thanks for the new perspective, from a Martian robot’s eye. We have sure gone far from our roots. I think; Cosmic rays and radiation in general cause noise specks/faults in the CCD image that you would see like dust on your monitor. They can become hard persistent faults and a permanent speck in the images. About the uniqueness of life, Barrow and Tipler in The Anthropic Cosmological Principle argue we would be missed on either of two accounts; that existence depends on our perception of the Universe (the Strong Principle), or that we are members of a very small category that can’t afford any loss. Maybe that’s just dust in the Martian wind. I find the image exhilarating, not humbling. Speck, schmeck, we are the Earth-born. We have raised ourselves up, looked at the sky, developed ethics, invented science and have gone to the planets. We are making ourselves worthy to inherit the universe. The stars are next. I’m proud of us, we humans, happy to be one of us, and glory in the vision we have made. Or not. It calls to my mind Robert Frosts Stopping by Woods on a Snowy Evening, with the robot ‘little horse’ shaking its harness bells asking if there is some mistake. The poet man is put in mind of the “promises” he has to keep, of the miles he still must travel. We are not told, however, that the call of social responsibility proves stronger than the attraction of the starry woods, which are “lovely” as well as “dark and deep”. All the UFOs that have been landing on Mars come from there, according to Nosro Sllew. I think you can see the moon just below the Earth in the hi-res image. Just one pixel. Of course I am here. Where else would I be? If you look close, you can see the moon too. Doug Huffman – thank you for the cosmic ray explanation. Looks like Starry Night Backyard image. Humble Pie In the Sky of Mars! Am I crazy or did I catch Jupiter, Mars and Uranus in conjunction, during my last visit to Earth? Or was my Sony Cybersomething point-and-shoot very drunk at the time? I wonder when they, UNEP, comes forward with an catastrophic anthropogenic solar influence hypothesis ? So there is no need to go to Ganymede to make a picture of Earth. great photo but the Earth test with arrow kinda ruined the pic for me. You’ve got it right. There is a political and cultural group who are ashamed to be human, but they are a minority on this website. I can’t see anything, there’s a dead pixel in my computer screen in the exact spot where the arrow is pointing at. Here where I would get in trouble, if I were at rover control: I would work out the orbital mechanics and angles, then use the Rover to make some stone piles that described Earth’s orbit from Mars. Just to baffle some future alien scientist if we get wiped out. Yes, but we have the capacity to recognize that we exist. A speck – true. But, a thinking one. That’s pretty wondrous in its own light. Many see this image as belittling and it is. Now how about a much bigger image showing us in the Milky Way? I still can’t understand just how BIG the Universe is. I have tried but it just overwhelms me. Looks like venus over a California desert after twilight. God knows how to do things big! It’s quite interesting to see the high res image…. Our little moon under Earth’s bluish dot. As a telescope owner, I can identify with that, as I’ve looked at Mar’s little orange dot with its very faint “canali” on it many, many times…. and instantly could picture myself in my Martian backyard on a clear Autumn night looking at Earth’s blue marble and its big bright moon and thinking, “Coool!”. < I guess if you live on Mars, Earth is the Morning Star. No. For the Earth, Mars will be in opposition with the Sun on April 8. For Mars, the Earth will then be in inferior conjunction with the Sun. Consequently, the picture has been taken before the Earth's inferior conjunction, when the Earth was seen in Mars' evening sky. I have to say our atmosphere is better looking. Ooops–the last paragraph should have been outdented. Why is this humbling? It’s a photograph taken by a man-made machine sent over there for the benefit of us, Eartlings. We can even photoshop the image to make the speck called Earth fill the entire background of the picture. What calls for humility is the fact that, despite all our technological prowess, we are still extremely good at creating one mess after another (even though these messes cannot be seen from Mars). Nice picture! I hope to be a witness of a manned mission to Mars. Fascinating planet. ‘You are here’ and ‘speck in the cosmos’ in the comments made me think of this movie: “Star Size Comparison”. A very nice line-up of the moon up to the biggest know star. It’s huge! So if we send folks to Mars, that is what home will look like? Too frightening for me. No thanks. Ah, but there is One… Who never takes His eyes off us… Who loves us…. that he gave his only begotten son… . Thank you for sharing that wondrous sight, An-tho-ny. And why are we all here? Thank you, Scarface,, for sharing that excellent video. I would disagree with the video’s concluding assertion, however. In God’s eyes, we are the center of the universe. Pretty amazing. 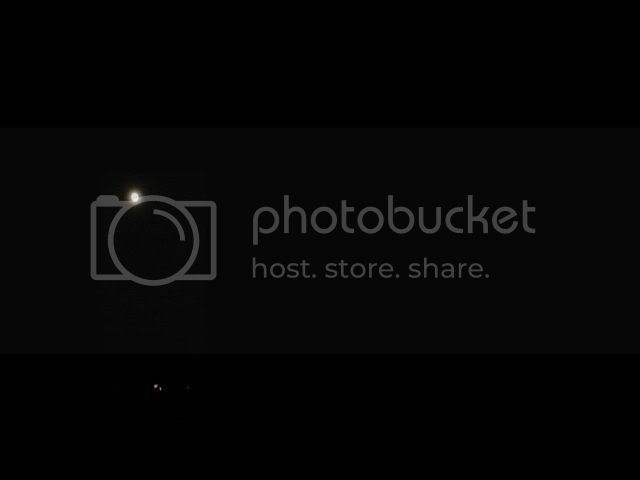 Kinda cool I guess, but it’s still just a capture of photons emitted, minutes earlier. We’re looking back in time, but then again are we ? could we ? 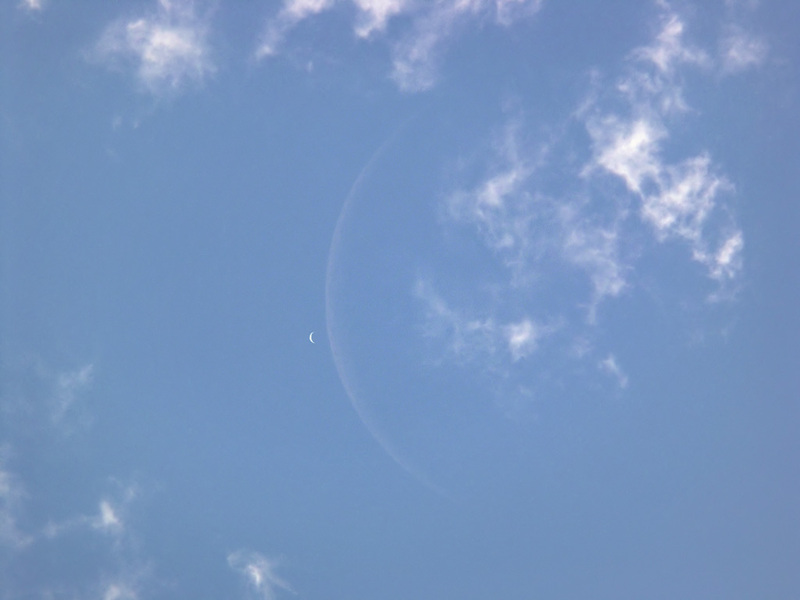 A truly amazing sight, were it possible, would be the view of the Earth/Moon system from Venus when Venus is at inferior conjunction. Although the Earth’s albedo is lower than that of Venus, it (the Earth) would appear far brighter than Venus ever appears from Earth. As Venus approaches the Earth along its interior orbit, it grows brighter as the distance decreases. But as it continues its approach, it presents a progressively larger but thinner crescent which ultimately limits its apparent brightness. At it’s closest approach, the side we see is 0% illuminated. But at that same moment of closest approach, the Earth is 100% illuminated as seen from Venus — as is the Moon. The Earth would be about 3X brighter than Venus ever appears from the Earth, and the Moon would appear as a very bright star no more than 0.5° away (generally much closer). I’m wondering how you would go about proving that. In an infinite universe, any object would be in the center because the distance to the “edge” of the universe would be the same (infinite) in all directions. In a finite universe, if the big bang was asymmetrical, and our side expanded faster than other sides, it would still be possible for us to be in the center (although highly unlikely). It just bothers me when someone takes an assumption, even one that is highly probable, and elevates it to a fact. Climate alarmists do that all the time with assumptions that seem probable to them at the time but are based on incomplete or estimated data. Yes, and between the infanitesimally small and the infinite universe, we are at midpoint. So we are not really so small after all. I can see the Super Bowl champion Seattle Seahawks headquarters! Yay! Click on this included link at the top of the page in the intro paragraph. Now look at the amount of clouds over the ocean in the latest pic of the earth 2012 (the last one) as compared to those in 2001 and 2002 and then the early ones, Apollo 17 – 1978 and the earlier photo dated 1967. Surely this massive difference in clouds has to do something to the “global temperature” and surely CO2 is not causing it. I look great. I always thought I was pretty cool. Excellent. Such images never fail to give me wonder. Long may it continue. This recalls to mind an image i took some time ago. On the face of it, it does not seem so much but when you consider that we are looking at our Moon, Venus and Jupiter with accompanying stars then I think it’s thought provoking at least. Glass half full: When Snowball Earth 2.0 happens, it will be easier to see! Humbling to say the least! A favorite Moon, Jupiter conjunction with Calisto, Io, Ganymede, Europa visible. Google Earth could have done a better job. SAGR. 0 Nicholas Copernicus, what a pleasure it would have been for you to see this part of your system confirmed by so clear an experiment! It still remains an amazing insight by both Galileo and Copernicus yet there is another one in there that was missed. I see No.8 has their washing out again. Very small mote in a very large universe. So, if we destroy the planet none would notice. We better start to look after it then and give those plants the CO2 they crave. The origin of all learning and reason and humbug. humane kind to be duplicated. Even so that could be to low. Reminds me of the book cover for “Mostly Harmless”. Quick, everybody go outside and wave! Jean Meeus said “the Earth was seen in Mars’ evening sky”. May I add that a Stellarium simulation (which I have normally found very accurate) of the view simulated as from the Martian surface at 0800 UT (Earth time) on 31 Jan 2014 shows the sun had then just set, with the Earth’s altitude then 17° approx. If the photograph of Earth was taken 80 minutes later this would have been about 0920 UT when the Earth’s altitude was about 7° – but the Sun’s altitude was then only -6° so the photograph of Earth would have been slightly obscured by the Martian twilight, as shown. The Earth itself set at about 1025 UT, about an hour later; the apparent diameter of Earth was about 17 seconds of arc. And may I also quickly mention that your “Astronomical Algorithms” (2005 edition) is never more than an arm’s length away from my desk and is there as I write! Many thanks indeed for your fine and helpful work. I’m happy to live here on the Earth. 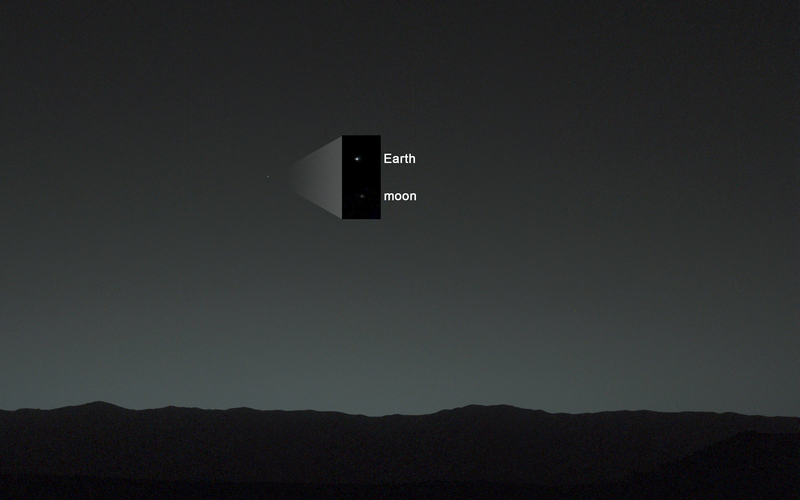 What a sight it would be to see the Earth in apparent retrograde motion as seen from Mars. Of course in the doom laden atmosphere of this era,nobody has really considered the partitioning of retrogrades between the inner and outer planets in terms of cause and effect. It can be done with modern imaging and graphics but requires people like David who have that type of spacial awareness to put the motions in context of the stellar background,the central Sun and the orbital motion of the Earth. I thought size didn’t matter. That’s what I hear a lot every time some professional bellyacher grouses about America throwing her weight around on the world stage just because she can. Actually, when enlarged, they appear to be visible, but ju-u-u-u-u-u-ust barely, and not very damned many of them. They are EXTREMELY DIM, and I can only see make out half dozen or so. If some are visible – and if the EARTH is so visible – I can’t reason out why the stars are so almost not there. With Mars’ thin atmosphere I am wanting to see millions of stars like on a super clear night out in the boonies. The Earth and Sun define the ecliptic, the plane of the planets. All the planets except the miniplanet Pluto are within a degree or so of the ecliptic. So a line from the Sun, which is out of sight below the horizon, to the Earth represents the ecliptic. The Moon should be near that line – but not often ON it.. The Moon’s orbit is tilted, so it most of the time is not on the ecliptic. And what do we see? The Moon is shown below the Earth in the image, and slightly NOT directly below. That is a perfectly reasonable place to see the Moon, relative to the Earth. If the Moon had been shown off to the right or left that would have been reason to accuse this of being a fake. So the photo passes this first level of vetting. The tinfoil hat folks should not have a field day. Yeay for that! It is interesting how far away from Eath the moon’s ‘orbit’ actually is. However, as E.M.Smith details here http://chiefio.wordpress.com/2014/01/25/a-remarkable-lunar-paper-and-numbers-on-major-standstill/ , the Earth and Moon are really a binary planet system with the Moon orbiting the Sun not the Earth. This picture emphasises the relationship. Amen, Brother!!! I too share real pride in our first toddling steps away from our ancestral crib. Let’s be done with this AGW nonsense and redirect all those funds to set sail on the solar system seas and have roaring adventures out amongst the planets! When I read Pat Frank’s comment at 2:53pm, I started humming “What A Wonderful World”… and Louis Armstrong’s version is my all time fave. I cracked up, when a few comments down I saw you had already posted it! OK – Are you and Janice both looking into my faves playlist?! Oooooh, Mackie! Am I glad to see you! I’ve tried to say “Hi” to several people (usually, at least two attempts per) over the past few days (“How’s it going” kind of posts) who just ignore me. What a joy to “hear” your booming, cheerful, voice. Thanks! Glad you enjoyed it. Definitely a fave. And….. wasn’t it soooo wonderful that THE SEAHAWKS WON THE SUPERBOWL!!! That was sooo cool. I’m still smiling. Even if you are still a Packers fan, didn’t you rejoice? @ dp — Thank you for posting that! What a sweet version — lovely voice. Well, Steve Garcia, rats!! Over 4 hours have passed and no one knowledgeable has answered your excellent query around 4pm today. I wish I could. Perhaps that the photo was taken “about 80 minutes after sunset” explains it? Would the brightness in the sky still be bright enough to obscure the stars? Seems like the answer would be, “No.” Then, there was this: “image has been processed to remove effects of cosmic rays.” Relevant? I HAVE NO IDEA. So, yes, you ARE pretty special — no one else noticed (apparently) the lack of stars. I’ll admit that I didn’t even think about it. And, YES (thank–You–Lord) there have been (oh, great, now that I’m speaking of them…. D’oh!) no nuts on this thread. They can be great entertainment, but they just don’t know when to quit. And I want to have fun teasing them, (and sometimes, I do!) but, then I feel guilty because they really believe, with all their hearts, their stuff. Anybody have an answer for Steve Garcia? (re: Q at 4:03pm today)?? It is common to stack and stitch astrophotographs to produce a real yet manufactured view of reality. All the elements are where they belong but not in the context presented. That means only that a real photo of Earth and a real image of the Martian sky were merged to produce an astronomically correct but photographically unlikely image. This is particularly true with color images taken with radio telescopes. Radio waves have no color including white and black, so any generated image using RT data is necessarily artificial, but scientifically correct. Ultrasonic audio cannot be heard naturally, but when the frequencies are translated to our hearing range we hear the beautiful and haunting voices of whales singing tens or hundreds of miles distant. Thanks for all that great information, d p. Mahalo! Does anyone know what the brightness of Earth from Mars is compared to the brightness of Venus from Earth? I just wondered if the Earth from Mars is much brighter than the stars. I will answer it because nobody else can. Normally I would have a platform to present these findings but as astronomy is dominated by empirical riff-raff chanting voodoo I have to content myself with an unmoderated or lightly moderated forum. There is much more to say but I would need an open thread where readers could appreciate the issues and exercise their spacial awareness faculties for a change. Earth, the brightest object in the Martian sky, is barely even visible in the original. The answer is that all the stars are really dim (probably due to the photo having been taken at dusk). I also wonder if it has to do with Curiosity’s cameras. I might be wrong but I doubt if they were designed to do much “stargazing”. I’d assume they were made to look down, not up. You are all so WRONG. This is a 5p. sized piece of tin-foil stuck to the warehouse roof. There’s no ‘Martian Rover’, no Explorer; does nobody remember the fuss made over men supposedly going to the Moon, for goodness sake? That was another example of the credulity of those who wanted it to be true, and so easily disproved. And another thing, the supposed ‘Earth’ in the faked picture is blue; why? Because, and wait for the deniers’ howls of derision, backed up with nothing but anti-science rubbish, clearly THE EARTH IS WARMER THAN MARS. You only have to look at Mars to see it is red, and therefore cooler than Earth. Here comes the real science: Red is at the cooler end of the spectrum, blue at the hotter end this proves Earth is warmer, and getting hotter all the time, than Mars. The minimum brightness of Venus when it is on the far side of the Sun is magnitude –3.82. The maximum brightness of Venus when it is lit up as a crescent is magnitude -4.89. The Earth from Mars at maximum elongation*** (47.4°), the Earth and Moon would shine at apparent magnitudes −2.5 and +0.9, respectively. Ah, -1 is pretty bright. Solving for log10(b1/b2) gives (m2 – m1)/2.5. 3.0895 times brighter than Venus from Earth when Venus is at minimum magnitude. 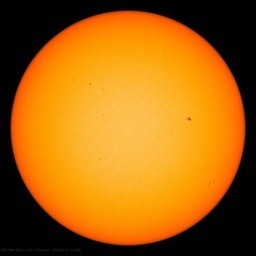 4.7398 times brighter than Venus from Earth when Venus is at maximum magnitude. You should be able to do the same for the Moon from Mars vs Venus from Earth, if you google the magnitude of the Moon from Mars. The -1 magnitude does explain to some extent why the image shows Earth and the Moon and VERY barely shows other stars. If Sirius was in the photo it would be slightly brighter, but most stars would be fainter. I would think that a longer exposure would bring out the other stars. I was expecting Earth to be about the same magnitude as Venus from Earth, meaning like a bright star, but it is MUCH brighter. I learned something. Even if I might have messed up the exact numbers. Thank you, Steve Garcia, for that fine answer! Much appreciated. Now, if there were only an easy way to let Gunga Din know… .